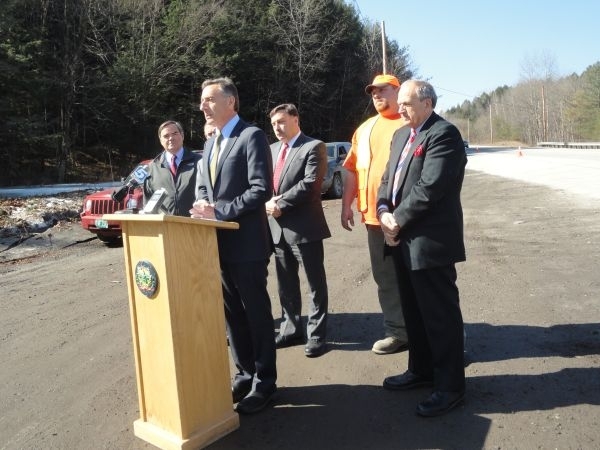 (Host) Governor Peter Shumlin and legislators have agreed to spend an additional $5 million on potholes and other spring highway repairs. As VPR’s Steve Zind reports, the money had been set aside for other winter weather projects. (Shumlin) "Hey, thanks so much for joining us this morning…"
(Zind) The Governor chose a muddy pull-off along Route 2 near Montpelier to highlight one of the benefits of the mild winter. (Shumlin) "Because of the warm winter we are able to take unspent money and allocate it to our spring paving and leveling program." (Zind) Shumlin says about half of the five million dollars is from winter savings and the rest from projects that were never started because of Tropical Storm Irene. The money will be added to existing spring road repair funds. That means about $11 million will be spent for the appropriately titled "Operation Smooth Ride" to fill potholes and cracks and tame frost heaves. The extra funding required the approval of lawmakers and the heads of the legislature’s transportation committees joined the governor by the side of the road. Lawmakers are currently considering transportation funding that includes more than $100 million dollars in road and bridge projects. Agency of Transportation Secretary Brian Searles says in recent years the state has devoted more money to road and bridge repairs. As a result, the percentage of state roads classified as ‘very poor’ went from a peak of 34 percent in 2009 to 25 percent in 2011. (Searles) "This is significant. It will represent three consecutive years of progress. And looking out to 2016, we anticipate paving programs in excess of this level." (Zind) Searles says federal funding is the wild card in calculating future progress on improving roads. Oil prices also have an effect on the cost of projects. The $11 million in Operation Smooth Ride money will patch up 123 miles of state highway. There are about 2700 miles in the state highway system. For VPR news, I’m Steve Zind in East Montpelier.